Oregon-based bank Umpqua Holdings announced yesterday its second-quarter dividend of $0.15 per share, a 50% increase to the $0.10-per-share dividend it paid last quarter. 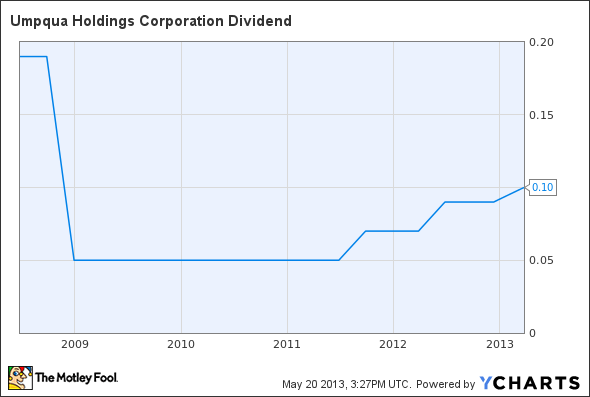 In addition, the bank will pay a special dividend of $0.05 per share. The board of directors said the quarterly dividend is payable on July 15 to shareholders of record as of June 28, while the special dividend is payable on June 14 to shareholders of record as of May 31. The increased quarterly dividend is due to the capital strength and the ongoing capital management here at Umpqua. This action does not rule out the possibility of strategic acquisitions in the future, as we continue to deploy remaining excess capital for the benefit of our shareholders. In addition, the special dividend was approved to catch up the first-quarter dividend to the $0.15-per-share level. The regular dividend payment equates to a $0.50-per-share annual dividend, yielding 4.4% based on the closing price of Umpqua's stock on May 17. UMPQ Dividend data by YCharts. Chart does not reflect new, higher dividend payment announcement. The article Umpqua Raises Dividend 50% and Offers Special Payout originally appeared on Fool.com.